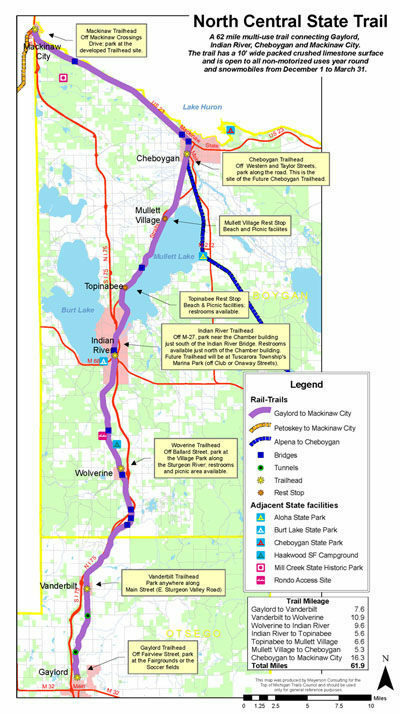 The North Central State Trail is not only one of the newest recreational trails in Michigan but the longest improved rail-trail, stretching 61.9 miles from Gaylord to Mackinaw City. Much of it is like any other rail-trail in northern Michigan; a flat, easy ride along a crushed limestone surface through woods and farms and pass trout streams. But arrive in the fall and there’s not another rail-trail in Michigan, or maybe the Midwest, like the North Central. For almost 8 miles north of Indian River you hug the west shore of Mullett Lake. On one side of you is the fifth largest lake in Michigan, lined by quaint cottages, weathered docks and old wooden lawn chairs and swings. On the other are stands of hardwoods in full fall color, creating a colorful barrier from M-27. 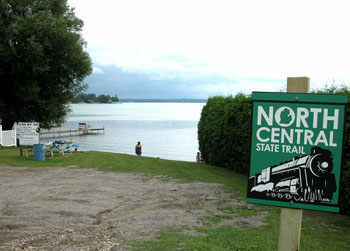 No surprise that in 2008 the North Central was named as one of the top five autumn destinations in the country by Rails to Trails Conservancy. 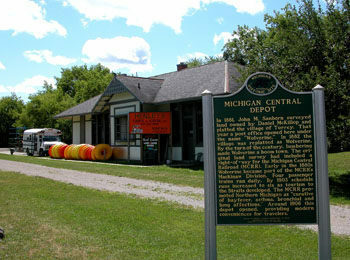 The North Central dates back to 1881 when the Michigan Central Railroad reached Mackinaw City. Departing from Bay City, the railroad passed through the logging towns of Grayling, Gaylord, Vanderbilt, Indian River and Cheboygan, moving lumber from logging stations to mills and mills to cities. When the Grand Hotel opened on Mackinac Island in 1887, the railroad’s main cargo became passengers, in particular tourists. Promoters touted the clean air, excellent fishing and freedom from hay fever to markets in Kentucky, Missouri, Ohio even as far away as the East Coast, carrying guests to a growing number of resorts and hotels. Even as late as the 1950s, the Michigan Central ran the “Timberline,” a weekend train that departed Detroit ever Friday afternoon during the summer. The train headed north dropping businessmen at their cottages along its route of which many would spend the trip in bar car, playing cards and swapping fish stories. On Sunday evening there was a return trip so husbands could be back at work while wives and their families stayed Up North at the cottage. By mid-1990 trail enthusiasts were already eyeing the now former railroad corridor from Gaylord to Mackinaw City. The trail was acquired in six separate transactions between 1998 and 2000 and then developed with a nearly $2 million federal trail enhancement grant administered by the Michigan Department of Transportation, the Department of Natural Resources and more than 40 local government units and organizations. By the fall of 2007 the 10-foot wide North Central had been resurfaced with crushed limestone and the following year it was officially dedicated. Although open to snowmobilers in the winter, the rest of the year the trail is for non-motorized activity, primarily cycling, hiking and running. The flat terrain makes for easy bicycling and the limestone surface is ideal for mountain bikes and hybrids. Arriving with a road bikes makes for a much more difficult ride. The two most scenic sections is the valley of the Sturgeon River and its tributaries reached north of Vandebilt and north of Topinabee where the trail hugs the west shore of Mullet Lake. Along with the main trailhead towns of Gaylord, Indian River and Mackinaw City, you’ll find restaurants, markets and accommodations in Vanderbilt, Wolverine, Topinabee and Cheboygan. 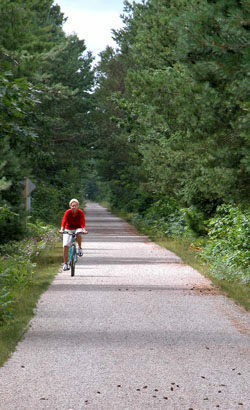 The North Central State Trail also passes through the Haakwood State Forest Campground just north of Wolverine. Coverage and maps of the trail had been divided into the southern half, Gaylord to Indian River, and the northern half Indian River to Mackinaw City. Contact the Gaylord Convention and Visitors Bureau (800-345-8621;www.gaylordmichigan.net) or the Top of Michigan Trails Council (231-348-8280; www.trailscouncil.org). For additional information on lodging, bicycle rentals and restarants you can also contact the Indian River Chamber of Commerce (231-238-9325; www.irchamber.com), Cheboygan Area Chamber of Commerce (231-627-7183, 800-963-3302; www.cheboygan.com) or the Mackinaw City Chamber of Commerce (231-436-5574, 888-455-8100; www.mackinawchamber.com). All the above chambers and tourism bureaus maintain visitor centers that are shown on the trail maps.